We are testing and reviewing the Wand-eeze Ergonomic Carpet Cleaning Kit. Somebody please put that thing on a scale! Great video Mo., it really changed my initial view of the product. I really like the looks of it now that I see it in a 360 way.....kind of excited about trying this thing. Unfortunately I don't have a scale I just found out my wife threw it away because it depressed her. I wonder if Android has a scale app? I weighed it on my fish liar scale over the weekend and it was a hair over two lbs. I want to see how much weight is lost by having the quick connects on the ground. 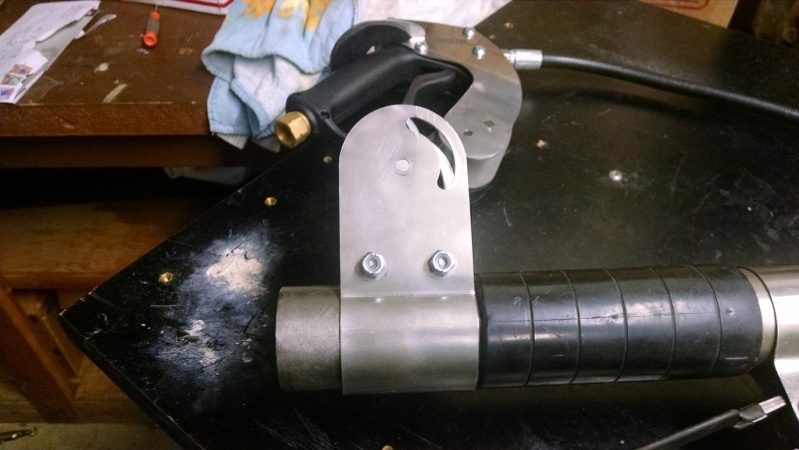 No metal wand valve/ lever and using the super skinny soultion line and my lighter and more flexable vac hose leader. ( ill send a vac leader to Mo if he wants on and an other mytee wrap to put between) It has to be over 1.5 lbs. Here's the way I installed it. It won't just slide over the tube you need to removes the bolts and nuts. Let us know if there's a better way Dave. Also is that the best location for the wand-eeze? It will usually slide on the tube if you take off those 2 bottom bolts. Or if you have to just loosen one side of the pivot and the black t jnob. ( you shouldn't have to take it apart like that ) you will also need 2" of tube at the end for your hose cuff. You will have to either cut back or remove that black plastic on your tube. You also might want to keep that 1ft solution line threaded through the zip tie like it originally was. Will do. I didn't have time to completely install it today. I was anxious to see how it felt swinging the wand. Ill take more pics and vids tomorrow. Don't take this the wrong way, the "Wand-eeze" is a good name, but I can't help but think of a grease gun looking at Mo's pictures. 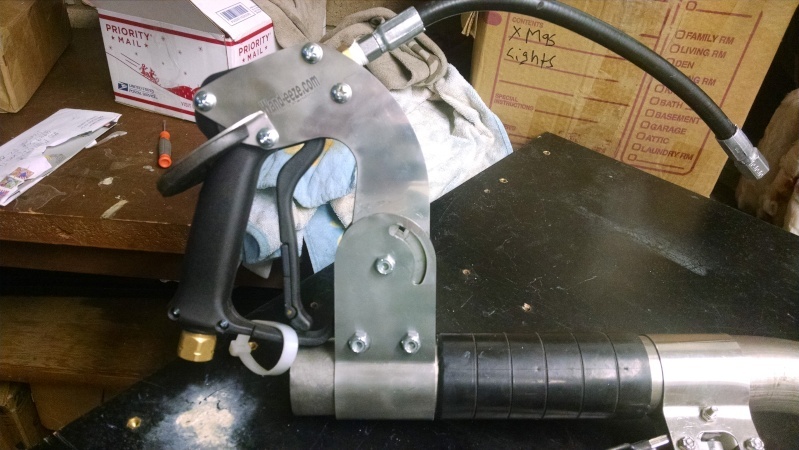 I might be the only one here that does, but I might have to nickname it the "Greaser"
Mo, move it forward about 6" where your hanger for valve would be, is what I'm thinking.......I could be wrong. But how are you going to attach your hose with it that far back??? BTW great video Mo!......with that song playing, all I can think is Puff Puff, Give........don't Bogart that trigger, Dude!!! Also, I have a fat lady's scale, aka food scale.....so when I get it I'll give the true weight of it. You only need 2" for hose cuff which is typical application. But, im going to move mine way up and experiment today. If you stick a screwdriver or something like it under your rubber grip and shoot some soapy water under it it will slide off the tube. Then you can slide Wand Ez up just behind your hanger, you do not need the heat grip if the wand ez is on the tube. @SCCC wrote: If you stick a screwdriver or something like it under your rubber grip and shoot some soapy water under it it will slide off the tube. Then you can slide Wand Ez up just behind your hanger, you do not need the heat grip if the wand ez is on the tube. @milspec6 wrote: Don't take this the wrong way, the "Wand-eeze" is a good name, but I can't help but think of a grease gun looking at Mo's pictures. 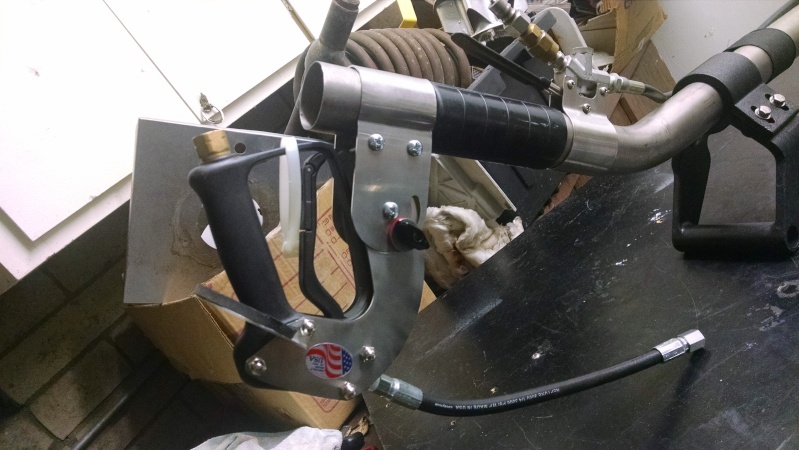 I might be the only one here that does, but I might have to nickname it the "Greaser"
@Davey Cracker wrote: Mo, move it forward about 6" where your hanger for valve would be, is what I'm thinking.......I could be wrong. But how are you going to attach your hose with it that far back??? I think the further back you have it the longer your stroke is. The longer your arm is, the longer your stroke......the handle could be connected to the head of the wand and your stroke would still be the same length..........but of course you would have to lay on the carpet to clean it. MO. The sorborthane pad should be all the way up. Play with whatever angle you want. Do the S curve with the hose to manifold. The optimum angle should be around 45 degrees. But all the way forward you can do the two finger trigger by holding the bottom of the trigger. With higher angle you can try the open hand vac stroke. It all depend on situation. with a higher angle its also easier to one hand it in open areas. IL post a video of different ways to hold it tomorrow. It's pretty irrelevant, if you look close you see the angle of the wand drop waaaay down, at which point it's no longer at the proper angle to maintain suction. I really think arm length has just about everything to do with your stroke length, but I can see how a pistol grip might allow a few extra inches over gripping the tube of the wand, just because of the angle/placement of your hand. That's all I'm going to say about this, because I think I can see both sides of it, and the debate could go on n on about it. Oh so you're saying at the extension point of the stroke the glide is no longer flat on the carpet?